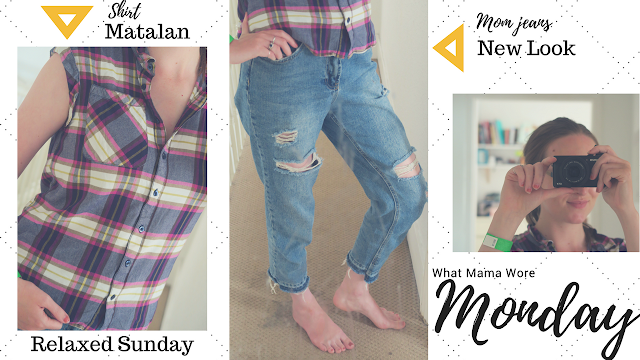 Welcome back to What Mama Wore Monday, hosted by Romeca over at Beauty Bump and Me and Tracey from A Snapshot of Me. We had a chilled Sunday which involved swimming for the first time as a family of five (can you see my swimming bracelet?). I'm glad I didn't wear skinny jeans as they are a right palava to peel on and off in a confined, warm space such as a swimming pool changing room. I'd definitely fall over! I'm enjoying the comfiness of the Tori Mom jeans from New Look. These were in the sale, here are some similar ones. I rather like this checked shirt from Matalan, again it isn't current. Great for breastfeeding, although it is loose enough to lift up rather than unbutton. Quick and simple!